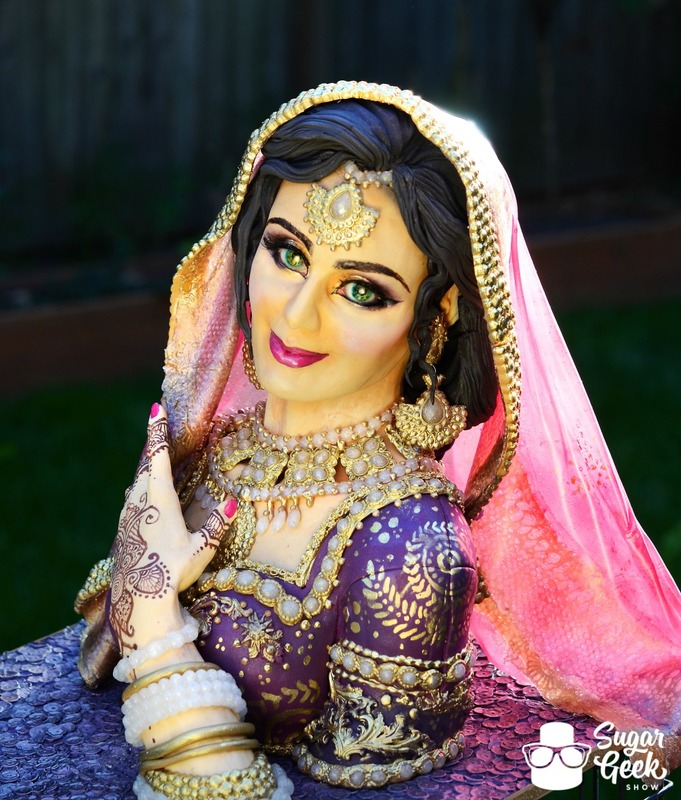 Liz recently participated in the international Incredible India Collaboration presented by the Global Sugar Artists Network and hosted by Tina Scott Parashar’s Cake Design. 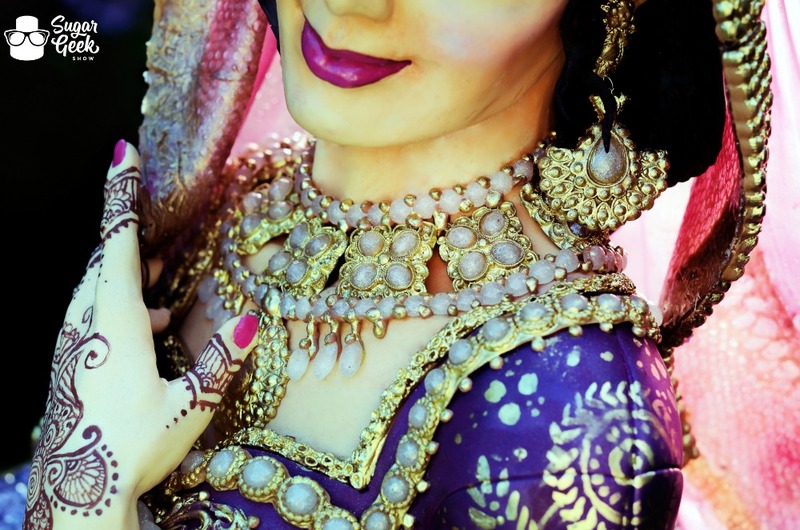 Liz chose to create a beautiful Indian bride bust cake that is nothing short of jaw-dropping. The detail and realism in the piece is incredible! 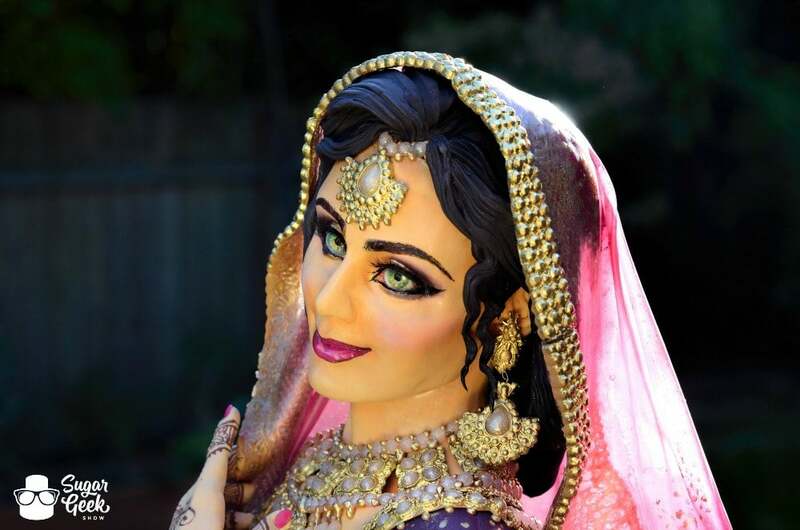 Much of the piece including the signature realistic eyes were made from Simi Cakes Isomalt and the fantastic veil known in India as an odani was created from Flexique Edible Fabric. Liz has attended a couple sculpting classes this year which has really helped her up her sculpting game. Her newly honed sculpting skills definitely shine in this piece not only in the face but also in the insanely realistic hand. 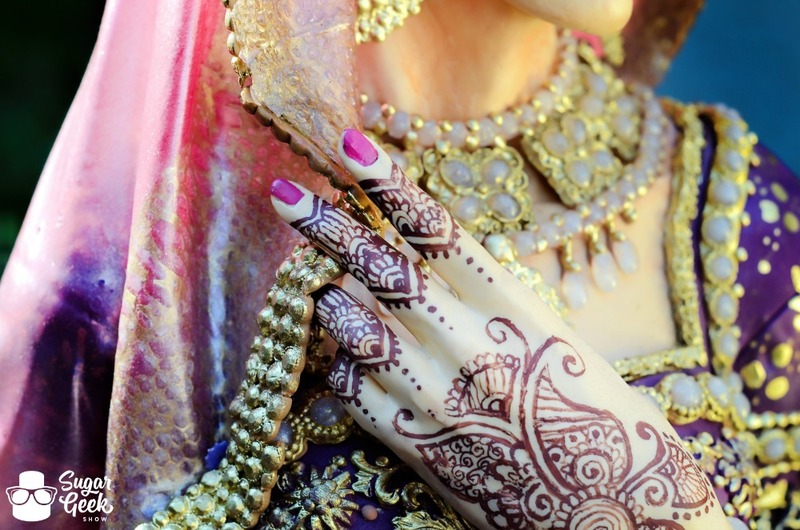 The hand painted henna tattooing is gorgeous and must’ve taken just short of forever. 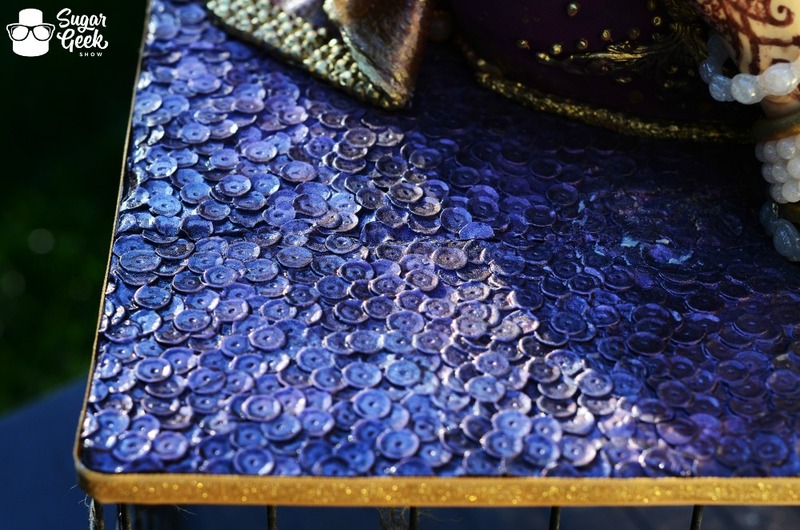 This shimmery sequin board really brings the whole piece together, I absolutely love it! The sequins look as if they were individually cut out and stuck on there and while Liz is crazy enough to do that, she actually used the Marvelous Molds Sequin Jubilee Simpress. That is definitely on my wish list! Overall the piece is phenomenal and really added to a brilliant collaboration for a wonderful cause. Check out the timelapse making of this piece in the video at the end of the post! When talking with Tina Scott Parashar she explained that Incredible India is an international cake collaboration born out of the collective effort of over a hundred very talented cake artists who have come together to create visual works of brilliance through their favorite medium, sugar. India has been the nurturer of tradition and culture for long. When so many cultures amalgamate together, a rich heritage is born. It is from that heritage that the artists drew their inspiration. This is a collaboration with a cause. They have released a book/ magazine which includes all the collaboration cakes, recipes, interviews and tutorials. It has an interview with our very own Liz Marek and if you’d like to purchase a copy email Tina Scott Parashar at tinaparashar@gmail.com. The e-mag is available now and hard copies will be available December 1st. Every cent that was raised so far through magazine advertisements (Indian Rupees 1,50,000 /€ 1959/ $2313) has been donated to the Prime Minister’s National Relief Fund (India). Given all the hard work that was put into this collaboration, it was gratifying to receive such overwhelming response from the industry. They were also very pleased with the significant amount of money they were able to raise for a very worthy cause.